To go with the Sloppy Veggie Joes I wanted to make some whole wheat rolls. While these take a while to make most of the time is just waiting for the dough to rise, the actual hands-on time is pretty minimal and easy. They’re super delicious. 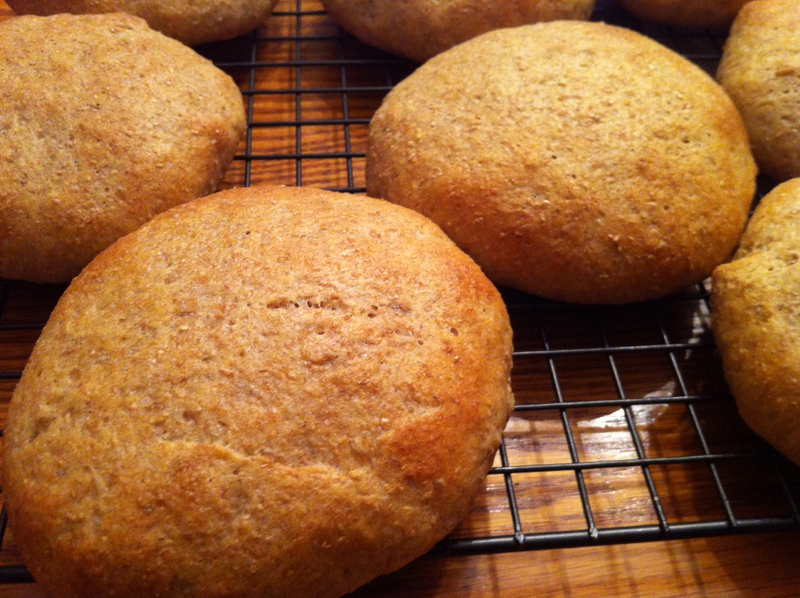 I love that they’re made with whole wheat, but they still taste soft and wholesome. I might need to go eat one now…just talking about them gives me a craving. Combine the milk and butter in a microwaveable dish, microwave on high for about 1 minute, until the milk is warm but not hot and the butter has softened. Transfer milk and butter to a large mixing bowl. Stir in the honey and sprinkle the yeast on top of the liquids, stir to dissolve. Add in the egg, white whole wheat flour, and the salt. Use a wooden spoon to mix until a sticky, loose dough begins to form. Gradually stir in the whole wheat flour until the dough thickens and starts to pull away from the sides of the bowl. Turn the dough out onto a lightly floured surface and knead in the remaining whole wheat flour, adding just enough to keep the dough from sticking to your hands. Knead for about 6-8 minutes until the dough is smooth and soft. Transfer the dough to a lightly greased bowl. Cover with plastic wrap and let the dough rise until it has doubled in size, about 2-3 hours, and the imprint of two fingers remains in the dough. Punch down the dough and let it rise until it has doubled again, about another 2-3 hours. After the second rise, punch down the dough and divide it into 6 sections. Divide each section into 4 equal pieces (so you’ll have 24 rolls). Roll each piece into a ball, place on a baking sheet lined with parchment paper, then flatten the ball with the palm of your hand. Cover the rolls and let them rise again until puffy and an imprint remains when you lightly touch the sides of the rolls, about 1 hour. Preheat the oven to 425°F. Brush the rolls lightly with the extra milk, then bake for about 11-13 minutes. The rolls will be golden on top and sound hollow when lightly tapped. Allow the rolls to cool on the pan for about 10 minutes, then transfer to a wire rack.